How food gets to our plates and what happens afterwards, connects many issues of concern, including health, biodiversity, climate change, livelihoods, and more. This means that by acting to change how food is produced, distributed, consumed, and disposed of, we can also affect these outcomes — either for better or for worse. However, to understand the implications of potential changes, we must understand how all these factors are interconnected and affect one another. In other words, we need to apply systems thinking to food. This chapter, and associated resources, provides an entry point into ‘food systems’ thinking and the multifaceted set of issues that are connected through food. It provides a foundation for the wider set of ideas and complexities that are explored in the other chapters of Foodsource. What is meant by the term food system? What are the major issues of concern linked to food systems? How can a food systems approach help us to address these more effectively? Food affects social, economic, moral, and environmental concerns in complex ways. To understand how, we need to adopt a systems thinking perspective. The whole ‘food system’ encompasses all the interconnections and interactions – spanning time and geographic space – between food, natural resources, people, organisations, government, organisms, the climate, and more. But such complexity is overwhelming. 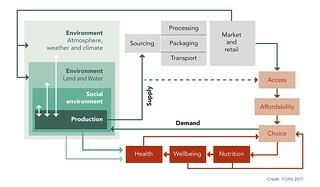 In practice, food systems thinking divides up this interconnected whole and makes judgements about which parts and interconnections are the most important for understanding the causes of things. Food systems interact with the environment in multiple ways, including as major sources of greenhouse gase emissions and as contributors to water and air pollution, biodiversity loss, deforestation, desertification, and land degradation. The food system interacts with people and society via health (e.g. malnutrition, infectious disease), livelihoods (e.g. employment and subsistence), consumption growth (e.g. driven by diets and population), and is shaped by power relations (e.g. gender, wealth, political and economic relations). Food systems are shaped by, and in turn influence, cultural, social and ethical concerns, including traditional practices and cultural norms; social identity; moral concerns about animal welfare and rights; religion and spirituality; art; and as part of shared experiences and enjoyment in social life. Because food is a point of interconnection linking social, economic, and environmental concerns, by understanding these interconnections, common solutions can sometimes be found that address multiple issues simultaneously. To be truly sustainable, food systems must operate within environmentally sustainable limits and at the same time, must also provide for basic human needs for nutrition, employment, health, and more. What sustainable food systems actually look like is still unclear, although our understanding is continuously growing. Garnett, T., Benton, T., Nicholson, W., & Finch, J. (2016). Overview of food system challenges (Foodsource: chapters). Food Climate Research Network, University of Oxford. Open University. Free course 'systems thinking and practice’. Future Learn. Free course 'Food and Our Future: Sustainable Food Systems in Southeast Asia’.